CHICAGO -- A federal jury has ordered a supermarket company to pay former Chicago Bulls star Michael Jordan $8.9 million for using the basketball legend's name and jersey number in a 2009 ad without his permission. The jury made the decision Friday evening following a trial that focused on the value of Jordan's name, CBS affiliate WBBM reported. The money would have to be paid by Safeway Inc., parent company of the now-defunct Chicago supermarket chain Dominick's Finer Foods. The chain took out an ad in a 2009 issue of Sports Illustrated, congratulating Jordan on his induction into the Basketball Hall of Fame. The ad included a $2-off coupon above a photo of a sizzling steak and the phrase "Michael Jordan... You are a cut above." Jurors deliberated for about six hours before coming back with the $8.9 million figure, at one point sending a note to the judge that said, "We need a calculator." Jordan said the money will be donated to Chicago charities. 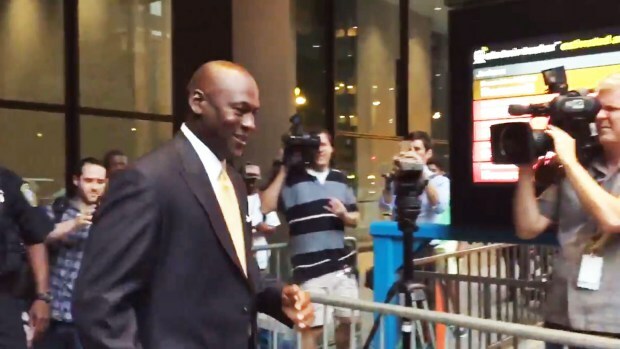 "It was never, never about the money," Jordan told reporters at Chicago's federal courthouse. "It was about the principle of protecting my name and my likeness. I just felt like someone took advantage of it, and I'm glad the courts totally understood that today." During the trial, Jordan's representatives said he fiercely protects his name and image and does not charge less than $10 million for a commercial campaign. Jordan has authorized the use of his name for charitable purposes.